Write even when you don't want to, don't much like what you are writing, and aren't writing particularly well. Moving forward with the continuation of Last Minute Decision. Considering I wrote this short take on what one wrong decision can do to one person so many years ago, I figure it is time to tell how it weighed on at least one of the other characters. Since I took away the very thrill of what happened, it is now time to tell it. Stay tuned, and thanks to all those that have supported my decision to put the first story out there for all to read. "A goal casually set and lightly taken is freely abandoned at the first obstacle." "To get what we've never had, we must do what we've never done." My first giveaway on booklikes has ended.. Thanks to all who entered! My book is small, but the message is fairly universal. I wrote it so very long ago, and am so very proud that I have been able to publish it. I have recently, started writing another book, that will bring to life what something like this can do to all those involved. This whole writing experience is still so new to me, but it is one of the most enriching and fulfilling things I have ever done! I wish I could spend my days writing and researching. Funny how it took me so many years to realize that is what I truly wanted to do when I grew up. So, even though I can't quit my day job, I am still gonna put as much time as I can into writing. Thanks to all who support and believe in me. 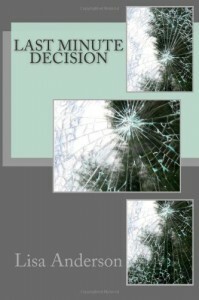 Currently working on the sequel to Last Minute Decision, and this one will be much longer and will show just exactly how a last minute decision can truly change lives. In keeping with my quote for today, I have a strong belief that our actions are by far the most important thing we should pay attention to in our everyday lives. My story Last Minute Decision, shows how decisions born of misguided actions can change the course of one's life. The second installment of this story is coming along fine, and will show how it doesn't necessarily get better the morning after, and how the result of our actions can truly seal our fate. "Actions are seeds of fate. Seeds grow into destiny"
New Book ideas swirling in my mind. So, many people have commented on the uncertainty around the ending of Last Minute Decision. I know that when I wrote it all those years ago, that my thought, was that the ending could go in so many different directions, that I chose to leave it open. I know now, with my older wisdom now deeply ingrained, that cliffhangers are not as appealing in a book as they are on a weekly high drama show on TV. I am now playing with a plot that would address the outcome of the lives of a few of the main characters in Last Minute Decision. Hopefully, I can weave a story that will add more depth to the pages of my first writing project, but that will stand on it's own without the need to read (but of course would be helpful), Last Minute Decision. So stay tuned, for my upcoming musings on my new adventure.